Guilt is a loud devil on your shoulder. The past can drive you mad or drive you to change… sometimes a little bit of both. In Ernesto Diaz Espinoza‘s new film REDEEMER, a man known only by this title is a mysterious figure, righting wrongs among his small Chilean community. Tortured by an unthinkable past that is slowly revealed as the film progresses, The Redeemer must conquer his own ghosts in order to battle the biggest evil he has ever known. Can he protect those left behind? Marko Zaror, martial arts action star extraordinaire, takes on the lead with ease and ownership. Not only is his acting pretty damn stellar, he is also the fight coordinator for the film’s vast array of sequences that are enhanced by key moments of slow motion. These sequences are extremely long and well shot. It was mostly refreshing to see an organic quality about the battles. They are interesting and definitely full of surprises. My favorite aspect would definitely be the use of graphic blood splatter. Reading like a first person shooter game, the blood use is colorful, impactful, and sometimes just over-the-top enough to make you cringe at the perfect moments. The dialogue is creative and comic relief comes in the form of our only English speaking character, drug lord Bradock, Noah Segan, who I recognized from Deadgirl, is so natural in his comedy it should be against the law. He was actually my favorite part of the film. Segan has 8 projects this year alone, including Tales of Halloween with Lin Shaye (Insidious) and Booboo Stewart (The Twilight Saga), as well as The Mind’s Eye with Larry Fessenden (We Are Still Here). This guy is around for the long hall. Bottom line, if you liked Netflix’s Daredevil season 1, Redeemer will resonate with you. While it could be about 10-15 minutes tighter, due to the extended fight scenes, this film is definitely worth a shot. 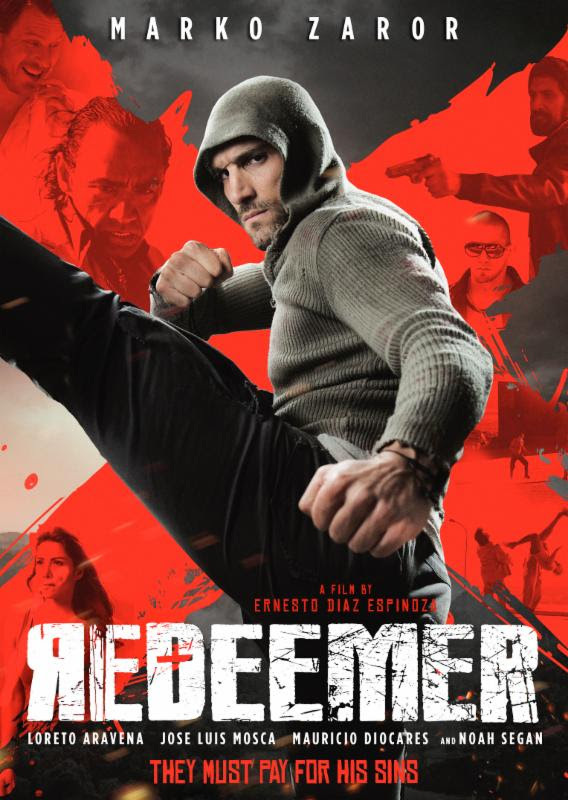 Acclaimed Chilean director Ernesto Diaz Espinoza (Mandrill, The ABCs of Death, Kiltro) teams up again with martial arts action star Marko Zaror (Undisputed III, Machete Kills) in the theatrical and VOD release of REDEEMER. The epic action film, which made its debut at the 2014 Fantastic Film Festival, hits theaters and VOD on June 12 from Dark Sky Films. This entry was posted in Foreign Films, Go To The Movies, in theaters, Liz, Netflix, Poster, Release, Reviews, Trailer, VOD, What To Watch This Week and tagged action, Booboo Stewart, Chilean, comic relief, daredevil, dark sky films, Deadgirl, drug lords, Ernesto Diaz Espinoza, fight sequences, first person shooter, haunted past, Larry Fessenden, lin shaye, Marko Zaror, martial arts, Netfilx, Noah Segan, REDEEMER, Tales of Halloween, The Mind's Eye, The Twilight Saga, we are still here by Liz Whittemore. Bookmark the permalink.